Homestead Revival: Simple Cookies with Big Flare! I love all those gorgeous Christmas cookies that are beautiful decorated with all sorts of icing and such. You know the ones... like Martha Stewart makes. But seriously... during the holidays, one of the BUSIEST times of the year, who has time to do all that? I wanted something that LOOKED spectacular, but really didn't require too much effort. Something the kids could help with. Found it. 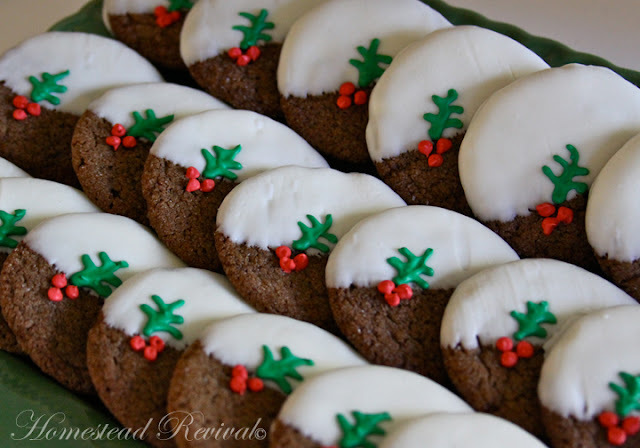 Jay's Catering in Garden Grove, California had these DARLING cookies. 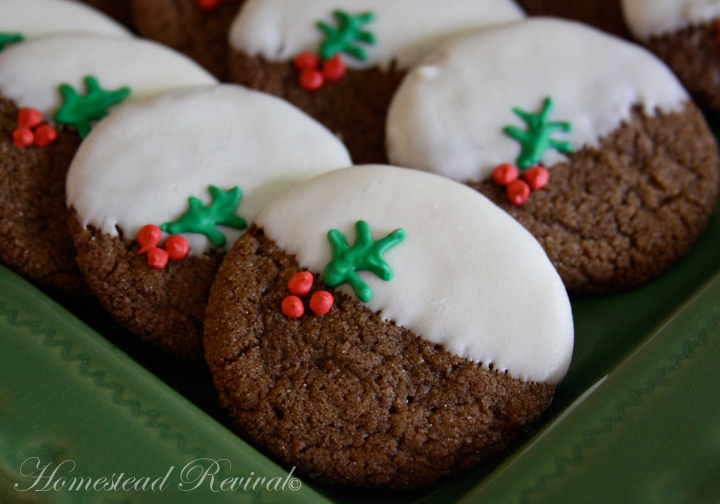 So I took their idea and made my own using a simple gingerbread recipe. I did modify them a bit... Jay's uses two cookies and sandwiches them between a cream filling. I skipped the cream filling. So how is this so simple? Well the cookies are just rolled balls, not cut outs. Second, the white on them is just melted white chocolate... dip and dry. EASY. Finally, the red and green holly leaf is about as easy as you can get with icing. You can crank these out in mass quick as a wink! I'm including the Gingersnap recipe for you here, but I would add more ginger if you want that sharp ginger taste, especially since the chocolate or candy melt softens it a bit. Personally, I wanted more of a bite to the cookie so as to compliment the mild candy taste. Really, you could use any cookie recipe and just decorate it accordingly. For the "chocolate", I just used Wilton's White Candy Melts, so they really aren't chocolaty, but if you can find the chocolates it would be even better. For the holly berries and leaf I used Wilton's Meringue Powder and coloring. In the bowl of your electric mixer (or with a hand mixer), beat the butter and sugars until light and fluffy (about 2 - 3 minutes). Add the molasses, egg, and vanilla extract and beat until incorporated. In a separate bowl whisk together the flour, baking soda, salt, and spices. Add to the butter mixture and mix until well combined. Cover and chill the batter for about 30 minutes or until firm. Preheat the oven to 350 degrees F (180 degrees C). Line two baking sheets with parchment paper. Place about 1 cup (200 grams) of white granulated sugar in a medium sized bowl. When the dough has chilled sufficiently, roll into 1 inch (2.5 cm) balls. Then roll the balls of dough into the sugar, coating them thoroughly. Place on the baking sheet, spacing about 2 inches (5 cm) apart and, with the bottom of a glass, flatten the cookies slightly. Bake for about 12 -15 minutesor until the cookies feel dry and firm on top. (The longer the cookies bake, the more crisp they will be.) Cool on a wire rack. Enjoy with a cup of Christmas tea!